Our customer tweeted a claim…..and we responded! Have you ever had an insurance claim? What was your experience like? I truly believe that claim time is the true test of an insurance policy- it’s then that you actually “see” your policy go to work for you. I’ve seen lots of interesting claims, but a recent one absolutely blew me away. Not because of what happened (high winds knocked a large tree branch on a home), but because of how we received notice of the claim and how it subsequently unfolded. Take note, as I think this is pretty ground-breaking and something most insurance companies can’t even comprehend yet. I can still barely absorb how it happened. The day it happened, I was sitting at my desk at Alan Galvez Insurance and just happened to glance at my Twitter feed (I always have Facebook and Twitter open as communication sources). I saw one of our customers, Tera, had just posted the following- “Well, it finally happened. That old tree hit our house.” The next post was from her husband Jon telling her to give me a call. I responded via Twitter asking Tera the extent of the damage and also telling Jon (he was at work), that I was on the claim immediately. Tera also tweeted me a photo (at right) so I could see the damage- the branch had gone through the roof and rain was coming into the house, You can see our conversation by going to my feed, and starting 10/26, looking for tweets between me and @Teradawn. Amazingly enough, a contractor friend (and the insured’s neighbor), was at his wife’s store next door to my office. I ran over and said “Allen, I need your help.” I told him the situation and asked him to please make temporary repairs as well as provide an estimate for permanent repairs. Within 15 minutes he was at the insured’s house. If you’re local and need some remodeling/contracting work, I highly recommend Allen Snyder of Snyder Home Repair. He does excellent work, is reasonable and very trustworthy. You can reach him at 937-592-4699. I also called a tree removal service that had done work for us in the past. Within an hour, they arrived and made plans to get the branch off the house (it was ultimately determined that a crane would have to be rented and removal would occur the next day). As I was making arrangements for these various services, I kept Tera in the loop, again via Twitter. I told her who was coming, their names and what was going to happen next. 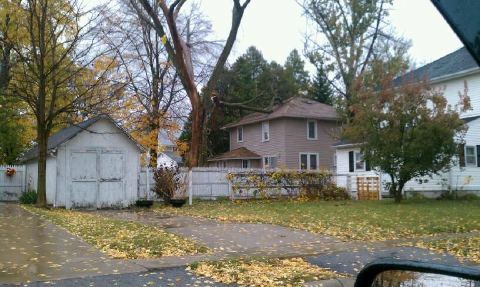 Within 24 hours the tree was off the house and Allen was busy fixing the exterior and interior damage. Tera and I communicated back and forth as to what else she needed to do to facilitate the claim (submitting estimates, etc.) It’s now a week later, and they are well on their way to having their house good as new. Whether you’re an insurance agent or a company, you need to be utilizing the various social media platforms as a communication source. Your customers are using them and you need to be there as well. Customers now dictate how they want to communicate with you, not the other way around. Listen up or risk losing out. The value of building a strong network can never be discounted. By having Allen do work for me personally as well as establishing a friendship with he and his wife, we’ve developed a strong bond. So he had no issue with grabbing his tools and running immediately over to Tera and Jon’s house. Try this tactic with a random contractor in the phone book, and see the response. I’m pretty sure it wouldn’t be the same. So having a trusted network IS everything. A corollary to the second point is that without a local agent, there is no way this claim could have worked out as quickly or as well as it did. Agents have networks and connections. They know who to call, what to say and will even roll up their sleeves and pitch in when necessary. We’re expediters, advocates, translators and even hand holders. Do you think the Geicos of the world can say this? That is awesome that you responded using social media. It is such a quick way of communicating, and keeping an eye out for claims, complaints, compliments, and questions which is always important when leveraging social media for business.They seem to be in good hands! Carrie, What a great story! Twitter FTW! Thanks for sharing your story! To those insurance folks who can't envision how social media could be productive in the insurance world…take note! I am still amazed at how this unfolded, and tremendously grateful I was paying attention. What an amazing communication tool! From start to finish, it took one week- the repairs are all done and the insured is more than pleased. Carrie – I have been trolling through your blogs and truly loving them one after another. This is a great one – we are a small agency in RI and we are just beginning our foray into enhancing our services via social media. I've shared with my "powers that be" as further confirmation that we are moving in the right direction. You are also providing inspiration for me as well, as I have been tagged with being our office blogger. Love the "voice" you use. Kigit- ah, so glad you are enjoying. I love to write and am very appreciative of all my readers. I'm glad the "powers that be" have seen the value of social media. It's here to stay and only going to become more important as time goes on. Social media is just a natural extension of what insurance folks do best- help people and build relationships. I wish you great luck with your blogging and I'd be happy to read your first post and offer any feedback if you wish. Thanks so much for your kind words. The "voice" is definitely me- I say that I write as if we're sitting across the table talking to each other. Let me know if I can help in any way.